The EU plans to allow only 5,000 refugees for resettlement by asylum seekers in response to the Mediterranean refugee crisis, reports the Guardian. Last year alone 150,000 people arrived in Southern Europe after surviving a trip across the sea. The measure is part of a package that EU leaders are discussing in Brussels on Thursday. The British newspaper cites a confidential draft conclusion of the summit that outlines the union’s response to the inflow of illegal immigrants from North Africa and the Middle East. The draft suggests “setting up a first voluntary pilot project on resettlement, offering at least 5,000 places to persons qualifying for protection.” That would be one 30th of the number of immigrants who reached Europe in 2014. This year more than 36,000 of them have arrived in countries like Italy, Malta and Greece, the newspaper notes. While allowing the few lucky ones in, the EU plans to aid southern European countries establish a system to fast-track asylum seekers. Emergency teems would be deployed to Italy to help register, fingerprint and process applications – so that the bulk of the refugees could be swiftly sent back to their countries of origin. The program is coordinated by EU’s border agency, Frontex. Aid would also go to Tunisia, Egypt, Sudan, Mali and Niger to help them better monitor their land borders and intercept would-be refugees before they reach the Mediterranean coast. Europe hates the unpeople. I guess some old habits never change. Earlier on Monday EU foreign and interior ministers agreed to double the funding of Operation Triton and Operation Poseidon, the naval border monitoring operations near the Italian coast. They were introduced to replace Italy’s own much more expensive Mare Nostrum operation, which was scrapped last year amid Rome’s complaints that other EU members would not share its burden with Italy. Unlike Mare Nostrum, EU’s operations are not focused on search and rescue and will not be in the years to come. Instead the EU plans to identify, seize and destroy trafficker ships before they load refugees on board and send them on potentially deadly trips to Europe. “Triton cannot be a search-and-rescue operation. I mean, in our operational plan, we cannot have provisions for proactive search-and-rescue action. This is not in Frontex’s mandate, and this is, in my understanding, not in the mandate of the European Union,” the agency’s head Fabrice Leggeri said on the eve of the summit. Since the change introduced in EU’s response to Mediterranean refugees some 1,500 people are estimated to have drowned in attempts to cross the sea. The bulk of that number comes from last weekend’s wreck of a ship near Libyan coast, which is thought to have been carrying some 900 refugees. 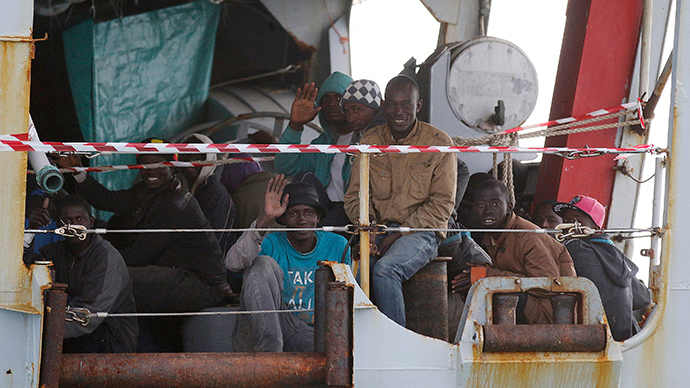 While it was continuing in 2014, the Italian Navy’s Mare Nostrum operation rescued over 166,000 people. Critics argued that rescuing the refugees was a ‘pull factor’ that encouraged more of them to take the perilous journey and ultimately leading to a larger number of deaths.